Pattern Cut Design F Discounts Apply ! Pattern Cut decorative return air vent covers have beautiful designs. These vent covers are cut by lasers at the speed of light creating intricate designs in your decorative return air grilles. You have the option of selecting between 26 different designs, ensuring you'll find a vent cover to blend in with any decor. These decorative return air grilles also come in 56 different sizes. If for some reason you don't see your size listed call 800-504-5989 for a quote. These grilles are measured by the size of the duct opening in your wall. Measure your return air duct opening width x height. For example, if your duct opening is 10" wide x 6" high you would order a 10 x 6 return air grille. The actual faceplate of the grille will then be 1 3/4" larger (in this example the faceplate will be 11 3/4" x 7 3/4"). These grilles are constructed from a 1/4" thick Baltic Birch. You can then choose between an Oak, Maple, or Cherry furniture grade face veneer. These vent covers can be stained to match your trim or painted to match your walls. They are shipped to you sanded and ready to be finished. We also carry an Adjustable Damper that works in conjunction with the Pattern Cut Grilles. The damper comes in 21 of the Pattern Cut sizes and will allow you to adjust the air flow. 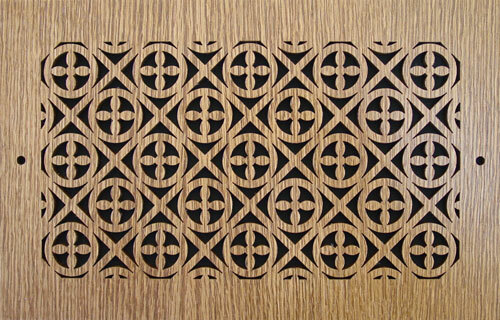 Pattern Cut Grilles are cut to order, lead time is 7-15 business days to ship. These wood grilles are special order, non-returnable and cannot be canceled once payment is received. - Fill a large pan with a the stain of your choice. - Submerge the vent cover in the stain. - Allow to dry in an upright position. - Once the grille is dry, lay it flat and spray with a laquer sanding sealer (2-3 coats). - Spray one coat on the back to ensure that the grille is completely sealed. - After the grille dries for at least 24 hours, gently sand it being extra careful around the edges. - Spray your decorative return air grille with a clear laquer and allow to dry for three days before installing in your home. Do not finish in or expose your Pattern Cut grille to direct sunlight. - The manufacturer recommends purchasing the Maple Veneer if you plan to paint the grille. - Thin your primer and apply to the grille using a soft brush. - Be careful not to let drips build up on the edges. - The best way to apply the paint is by using a spray, however, a brush or roller will also work. - Apply 2 finish coats and allow to dry completely before installing. The grilles are meant to be used in the wall and ceiling only.